I've been working on a new live coded musical and visual performance with a heavy emphasis on light and water effects. 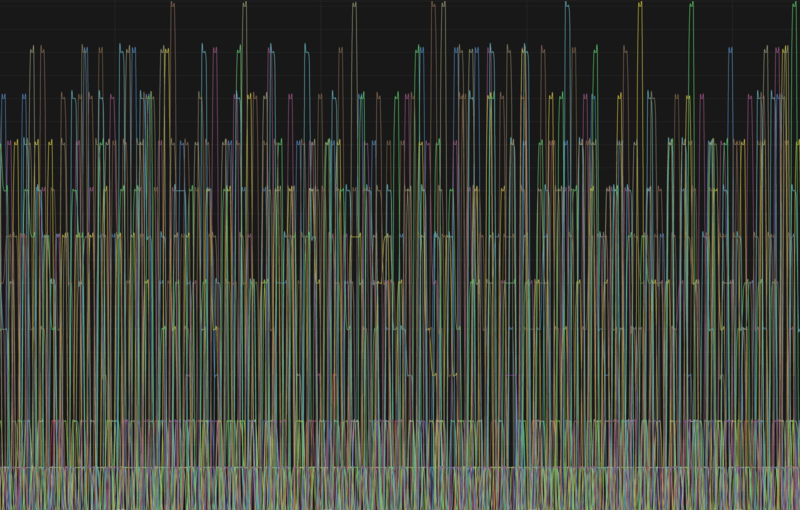 I've extracted some 8k screenshots from my performance work as Giclée prints (https://shop.josephwilk.net/). Made with Unity3D, SonicPi and Ruby. I was interested in what sort of ouput we would get from training a wavenet encoder on many voices but treating them as a single voice. 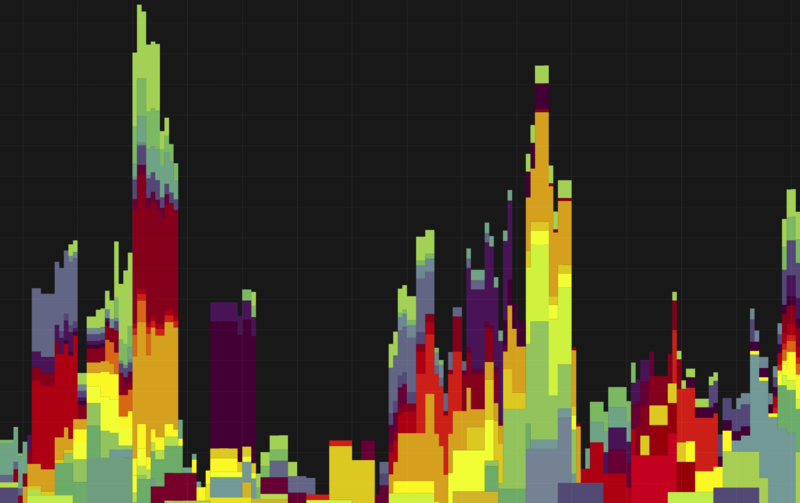 Most usages segment this dataset by person, gender and country. I used the GMU global accents database for training. I have been working on a project to use a sample dataset from the GMU Accent project to create audio and music. The project has over 2600 samples exploring accents from across the world. Everyone is reading the same text which highlights all the sounds of English. There are a huge variety of speakers and native languages with rich meta data for querying. 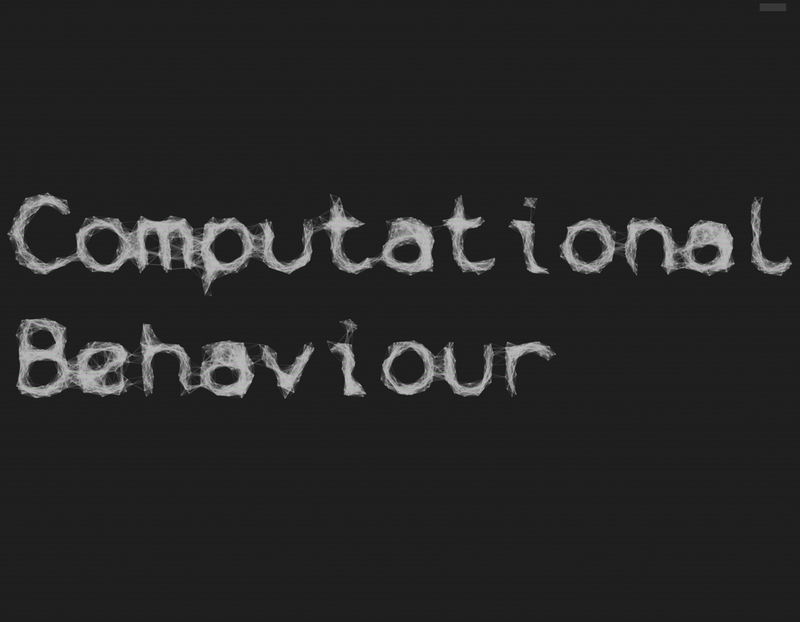 I've been exploring how this dataset could be used to explore communication and language, interacting with human dancers controlling sample parameterisation through sensor feedback. 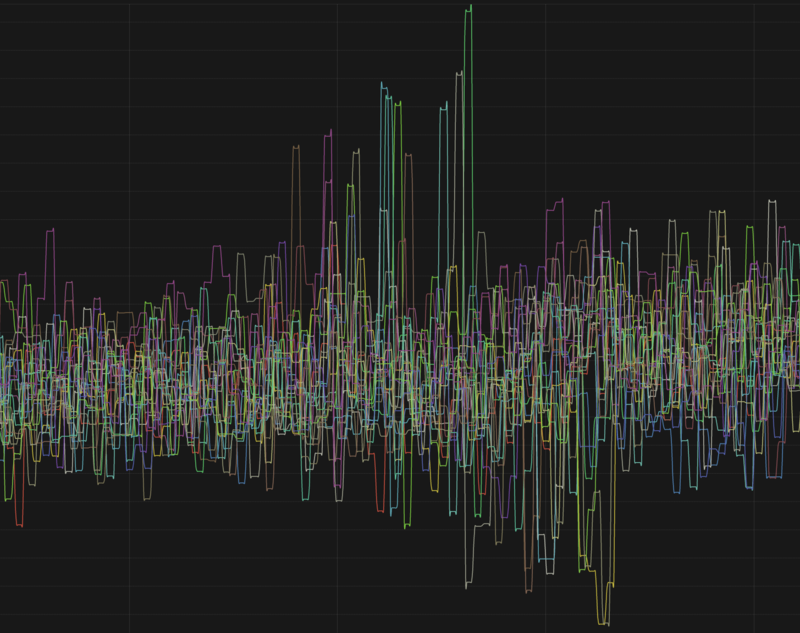 In exploring the data I did some simple DSP onset detection to extract all voices saying "train station". While very simple, it is deeply beautiful hearing such a wide pallet of voices. I created a library (http://blog.josephwilk.net/clojure/functions-explained-through-patterns.html) to help explain functions through patterns in color. 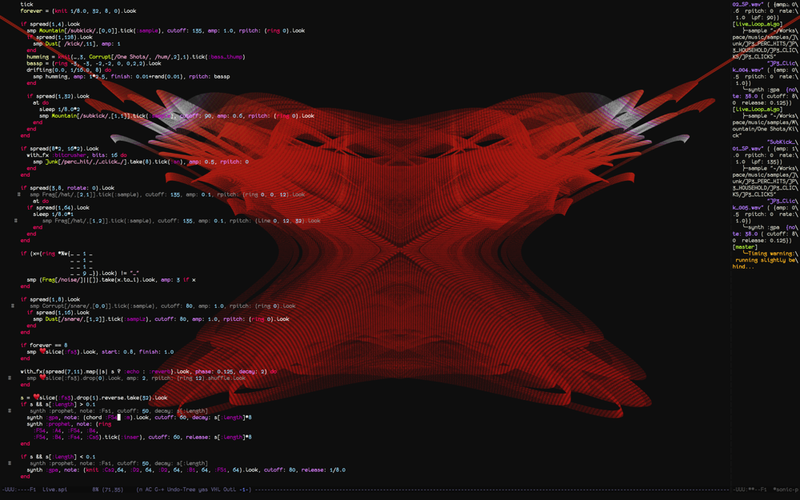 As a side effect this created a way of creating interesting patterns simply by composing functions. Instead of focusing on explaining functions I explored the patterns I could make. I've been exploring ways to deform meshes in 3D. 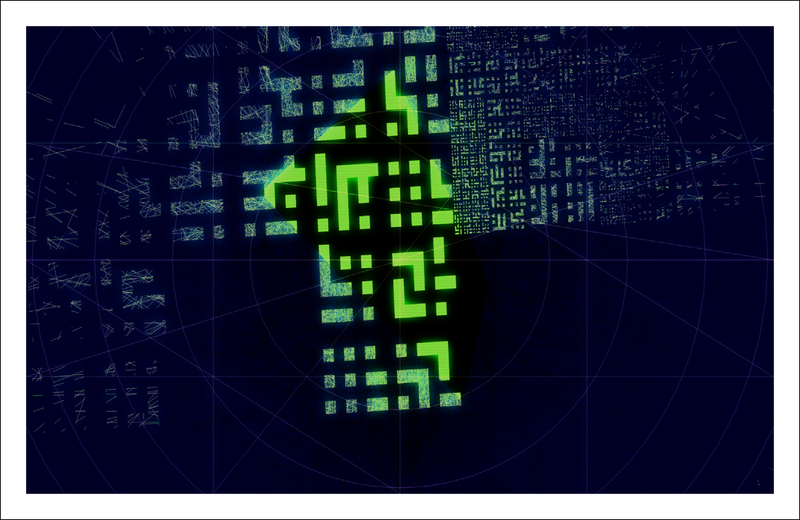 The best way in the end was to use a terrain map to alter the mesh positions of a sphere. 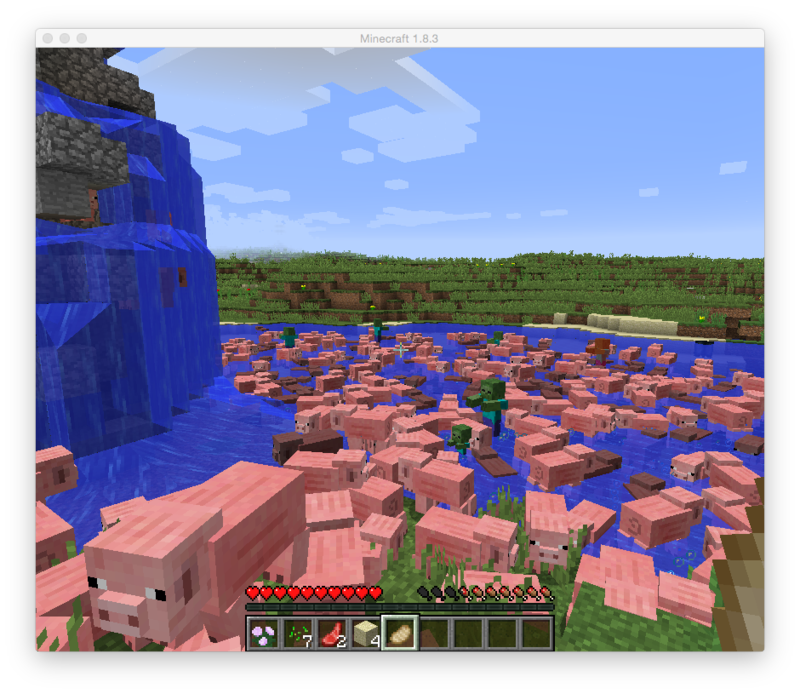 The terrain map was a blackwhite png where darkness maps to height. Effectively rendering a mountain range into a 3d mesh. Controlled by Emacs and SonicPi. Also using a focus blur for added effect. 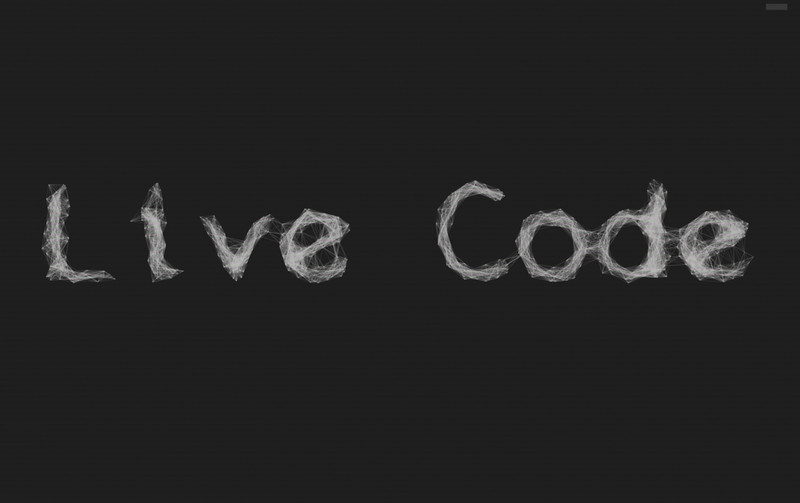 Exploring bringing the text of live coding into the generated visuals of a performance. Created using Unity. An attempt to create an eye like shape with the edges/tentacles feeling like origami paper folding. 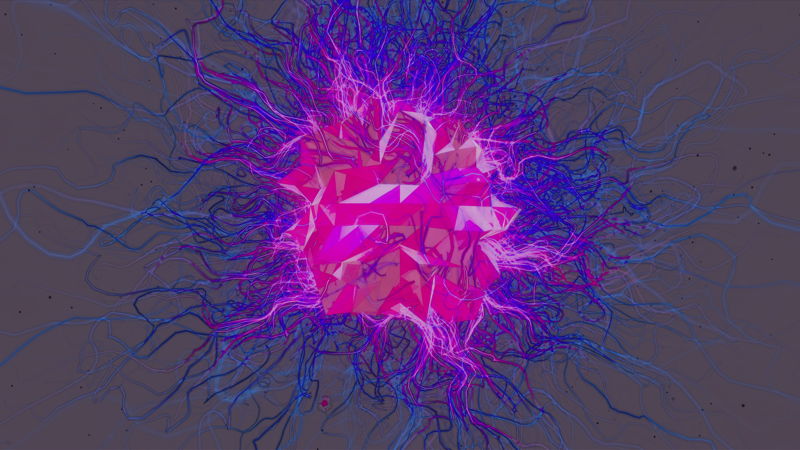 Achieved through increasing light intensity, a cartoon edge like shader applied as a postFX and repeatedly resting the laws of physics with the edges/tentacles simulation. Sending midi control data to a live running synth through Emacs. 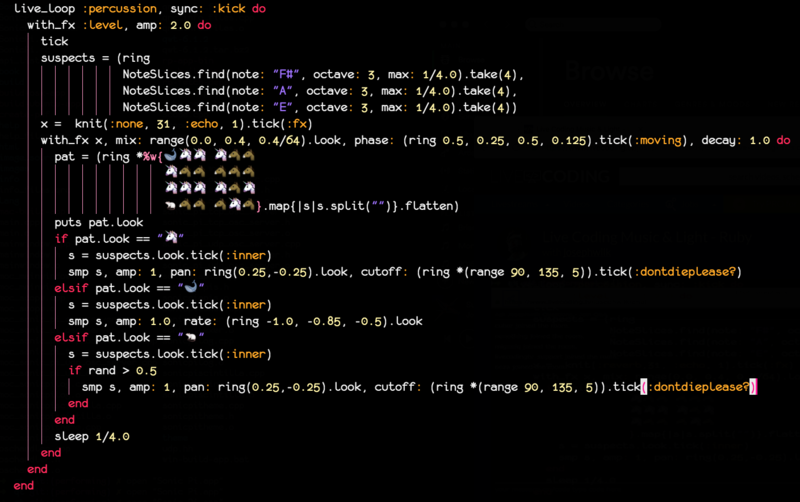 Emacs has a OSC port open which is sending messages to the synth. Using the cursor position in emacs to control the playback position in a sample. A little like scratching a record. 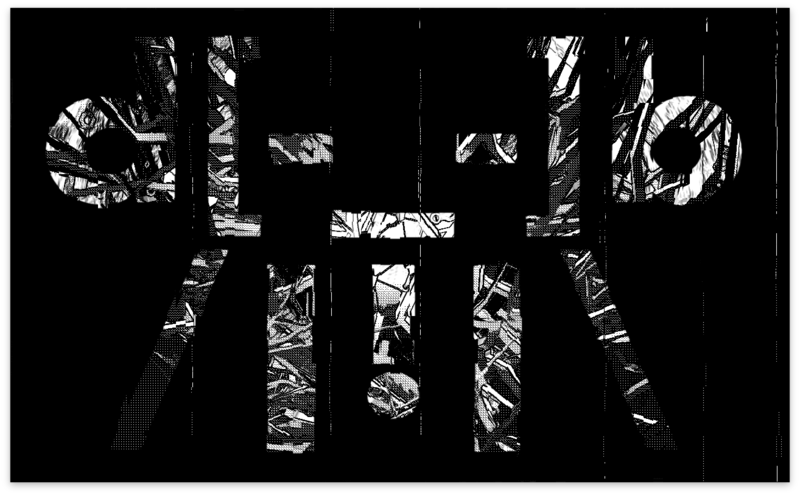 Snapshots of live generated visuals used in a performance. 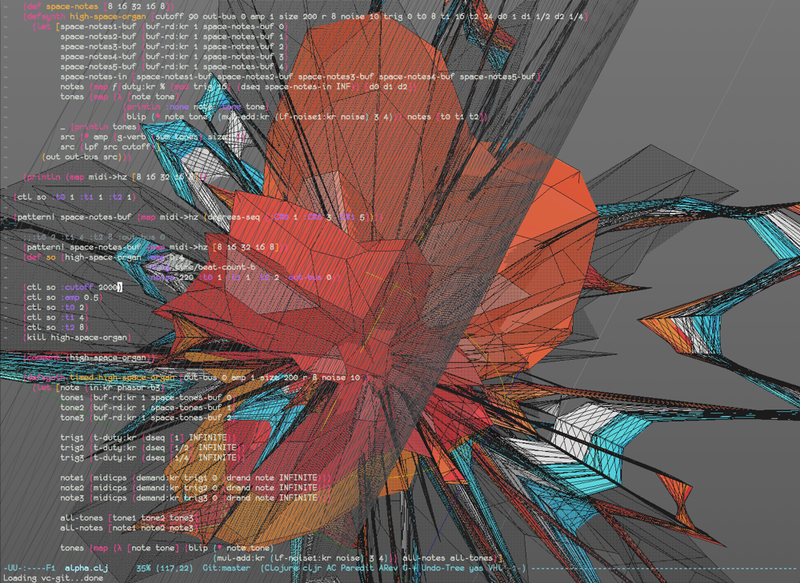 All the graphics are programmed in the GLSL programming language and that code is executed through OpenFrameworks and ShaderView. For some unknown reason I'm slightly obsessed with Soprano samples. I've been playing around with the idea of the human ear seeking meaning in a repeated phrase that still has an element of a human voice. I'm using wavetable playback manipulation, playhead speed and some added FM synthesis on a single 4 second Soprano sample. I've been thinking on some advice given by Deru. "Turn organic sounds into electronic and electronic into organic" Based on this I've been creating an instrument from two classical instruments sounds, a single 1 second sample of a Soprano singing a latin phrase and a single 1 second sample of a Violin. 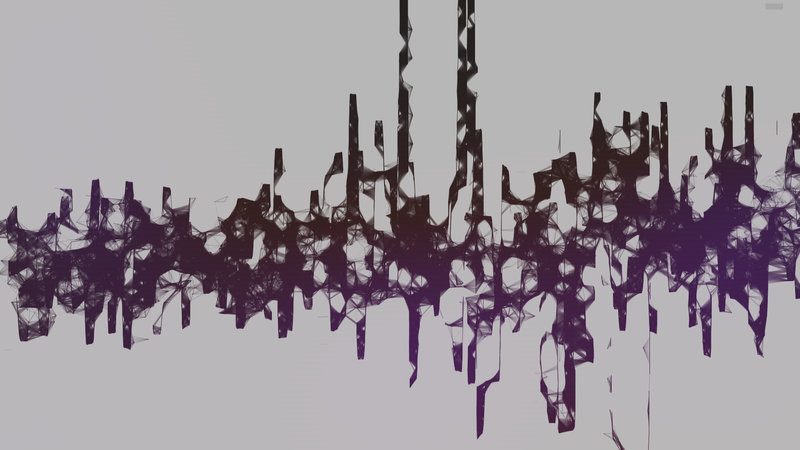 Added together with a lot of granular synthesis. Part of a new piece of music I'm working on. 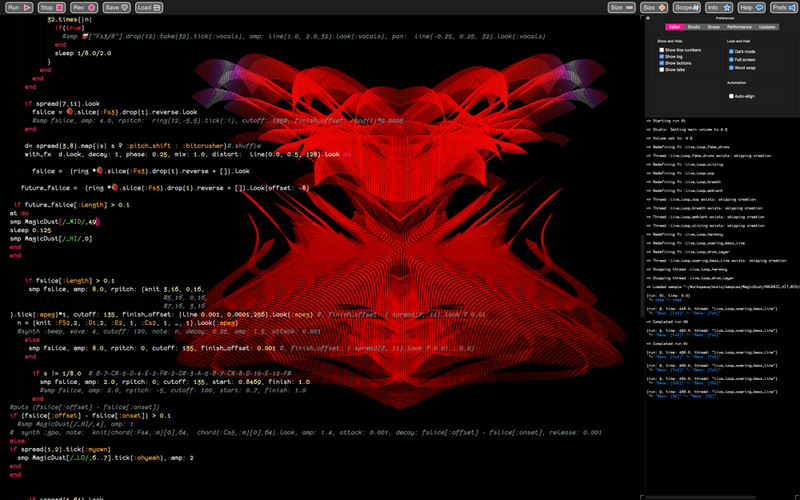 Created as part of a live coded performance. 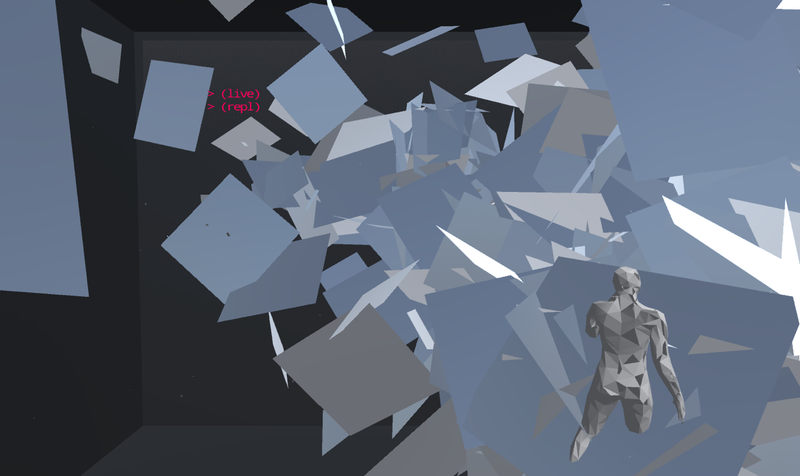 I'm writing code as part of the performance overlaid over the visuals. 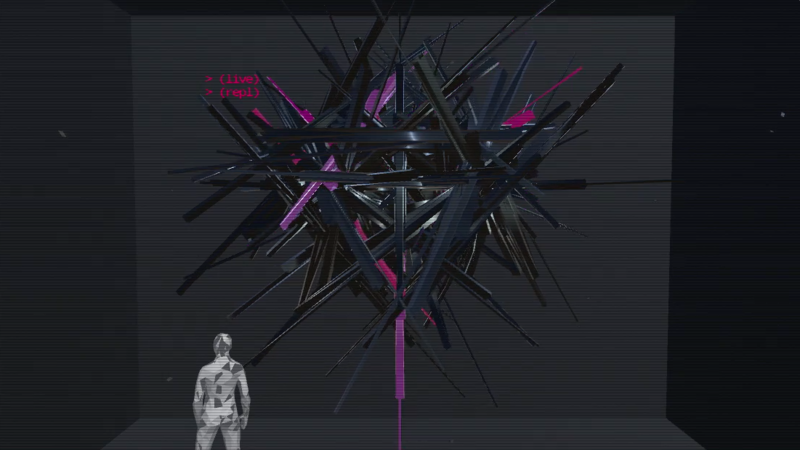 The visuals I'm controlling are someone watching someone live code. I recently added into ShaderView (https://github.com/josephwilk/shaderview) Post processing filters. Effects like bloom, fisheye, mirroring, noise and grain effects. Two of my favourite examples generated live. 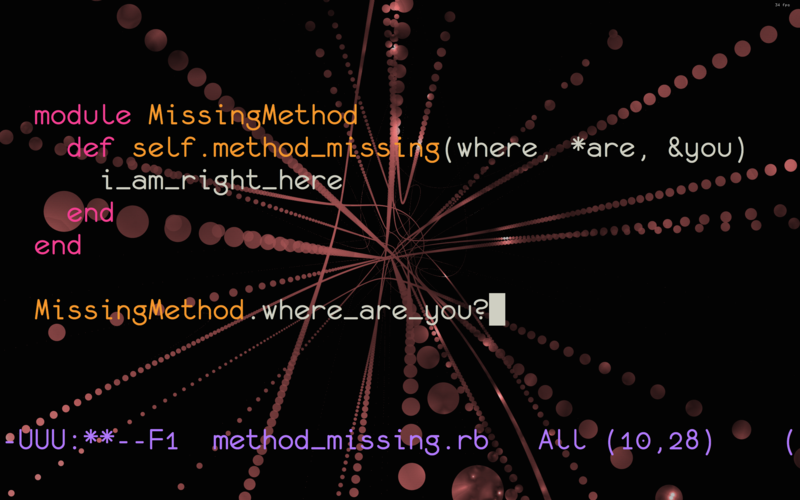 Method missing, the method that does not exist is a magical and confusing concept. I wanted to draw attention to how counterintuitive this method is and the pain of many programmers trying to understand the behaviour of code using it. 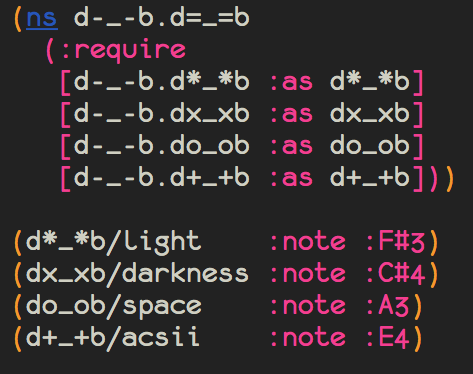 When searching text in Emacs, matching terms are highlighted. 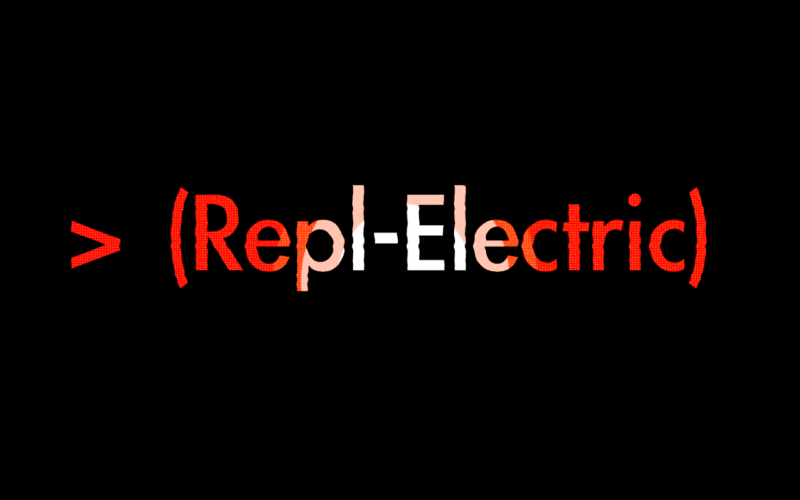 I wanted to explore creating visual patterns through writing regular expressions. I compressed a section of performance code and then in emacs created different searches. In live coding percussive patterns its common to mark a hit with '1' or 'x' and a 'rest'/'miss' with '0' or '_'. 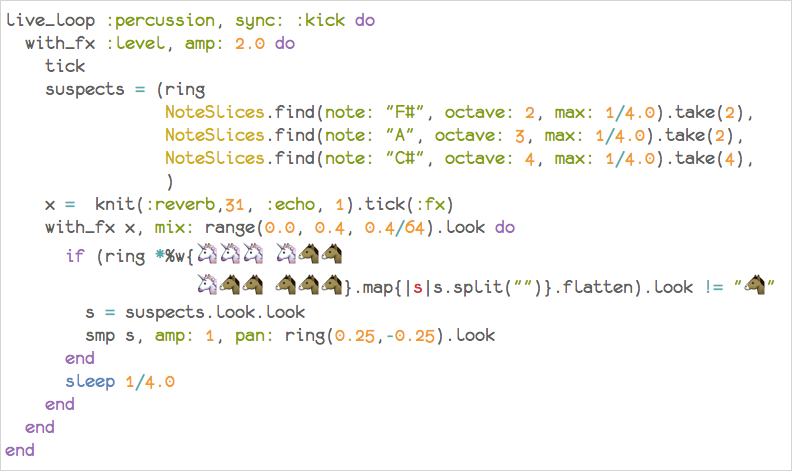 I wanted to expand the expressiveness of patterns with Emojis rather than text. To add an extra level of meaning for the audience and for my own mnemonics of mapping different types of percussive hits. Parameters like attack, release, velocity and sustain being different Emojis. Clojure supports a very flexible naming convention for namespaces and functions. I used this in a live performance to exploring using ASCII art to give a visual meaning to the containers of functions. Emacs is a editor used primarly by programmers thats heavily optimised to write and manipulate text. Here I take its text manipulation power and use it to create animations. Using the Sound Engine SuperCollider I'm sending messages to Emacs which contain the frequency. 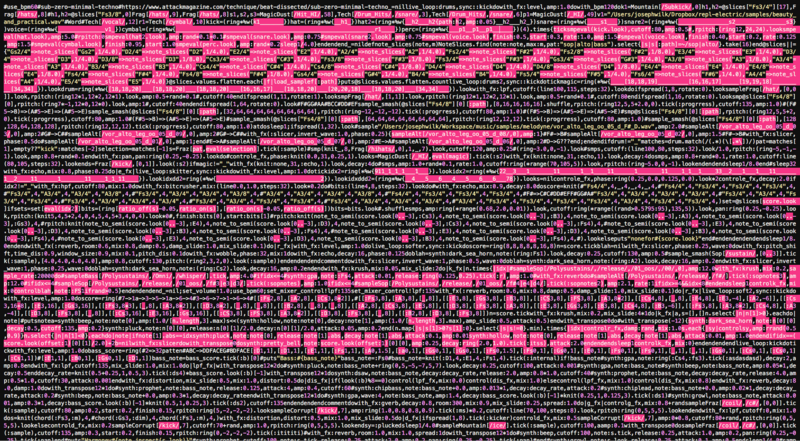 This is then rendering in a scrolling Ascii graph. 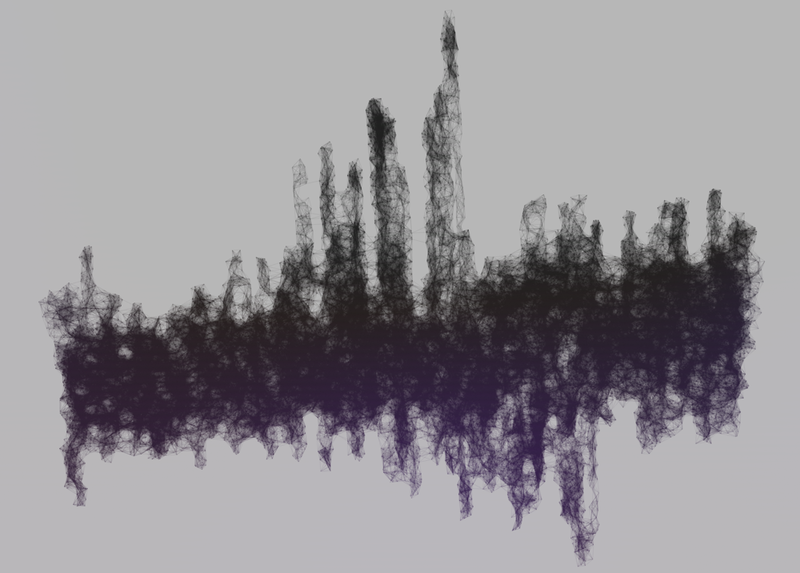 Converting live metric data from SoundClouds production systems into a mesh in OpenFrameworks. The connection of mesh vertexes is slightly random which creates interesting shapes between graphs peaks and troughs. Telemetry generate by the data pipeline at SoundCloud. 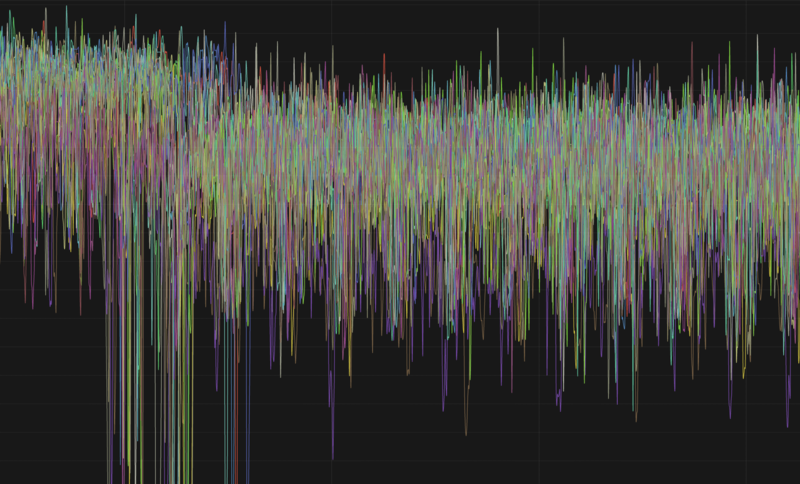 Graphs generated with https://prometheus.io. 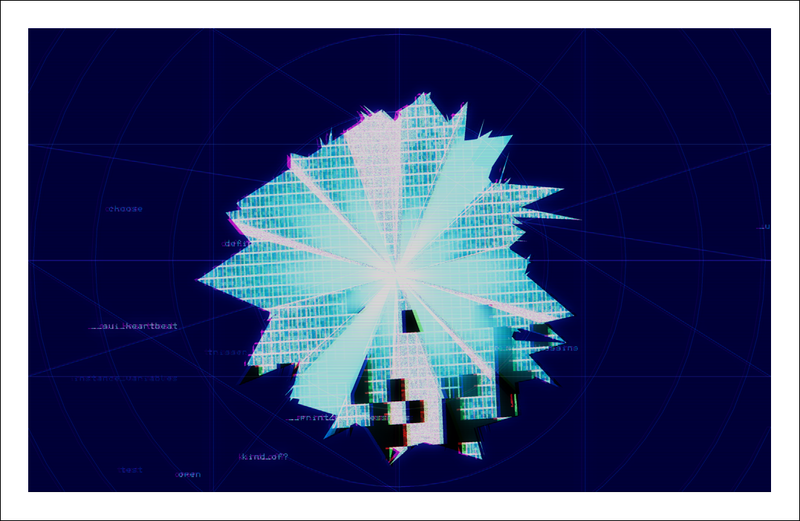 In most performances when I live code visuals and music the controlling code is overlaid over the top of the visuals. I've been experimenting with how to bring the text into the visuals rather than just sitting on top of it. 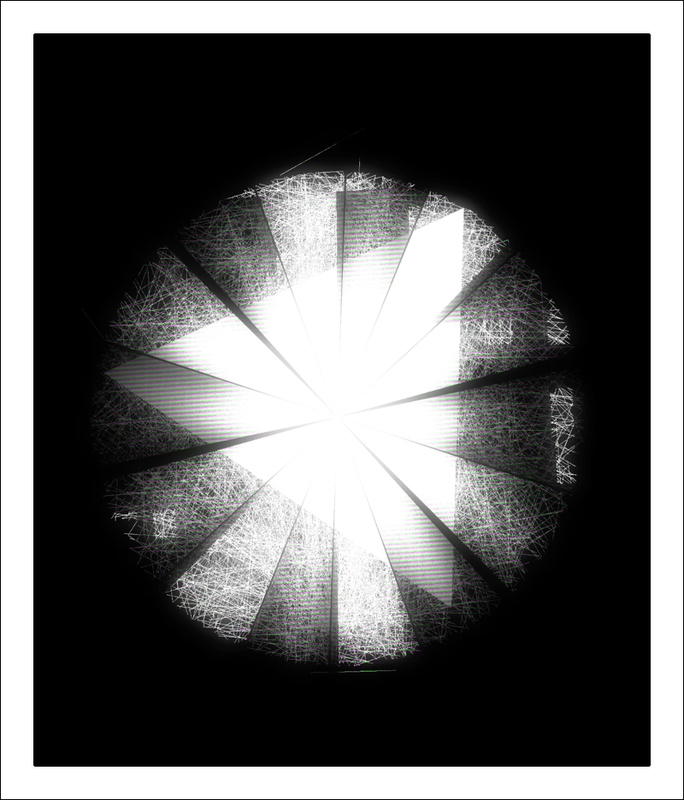 To do this I used OpenFrameworks I created meshes from black and white screen shots of text. 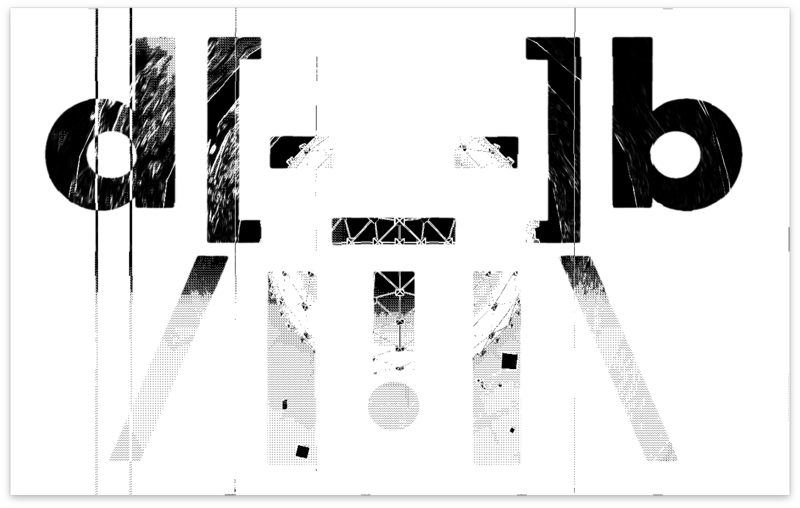 Then adding noise to the text mesh creating interesting distortions. Making the text feel more organic and alive while still being readable. Simple experiment controlling a Cinema4D scene from Overtone using OSC messages. 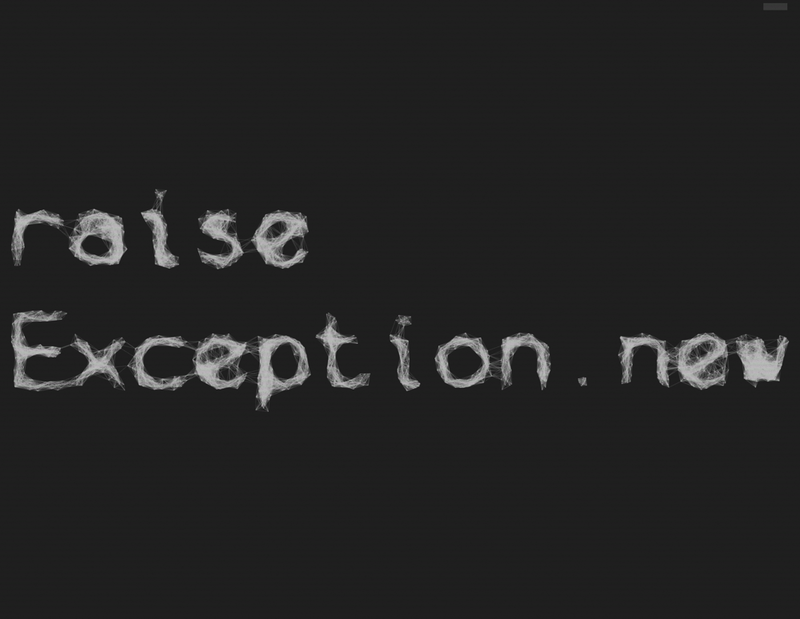 An experiment using a texture with transparent cutout text overlaid on top of a GLSL shader. Slight distortion on the edge of the text to better connect with the background texture. The DarkSeaHorn and Fallout Synths I implemented in Overtone. Mointoring a live SoundCloud production service by listening to the health status mapped to piano pitches. Low notes are good, high are bad.